I've been LOVING orange lately...all shades. Burnt orange, bright orange, even sherbet orange. I thought I'd share some of my orange finds from this week. Ready? OKAY! 1. 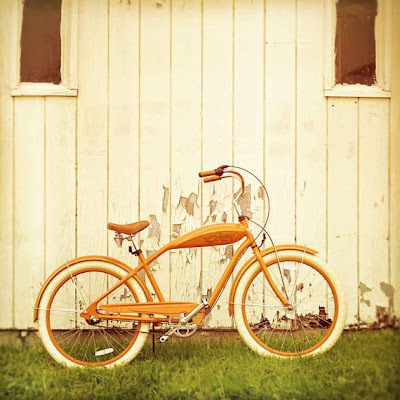 This orange bicycle print from Bucks County Frames on etsy. It's 140 buckaroos, but it sure is pretty. Am I right or am I right? 2. I got this scarf for my birthday & it's from Urban, but I can't find it on their website...so I took a photo with my phone & emailed it to myself. We're gettin' fancy over here, folks. 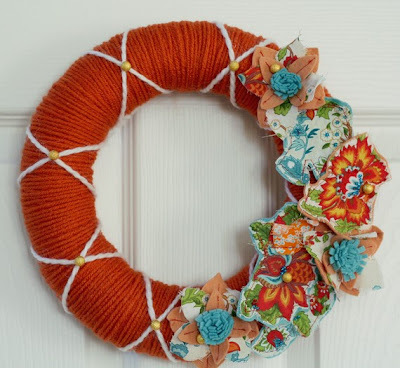 It's a light orange with birds, stripes, and fun little "ball" trim. I'm sure there's a technical word for that, but it's getting late. Pom poms maybe? oye. 3. 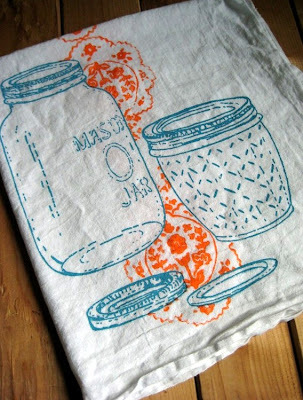 The Mason Jar Flour Sack Tea Towel from Oh, Little Rabbit. 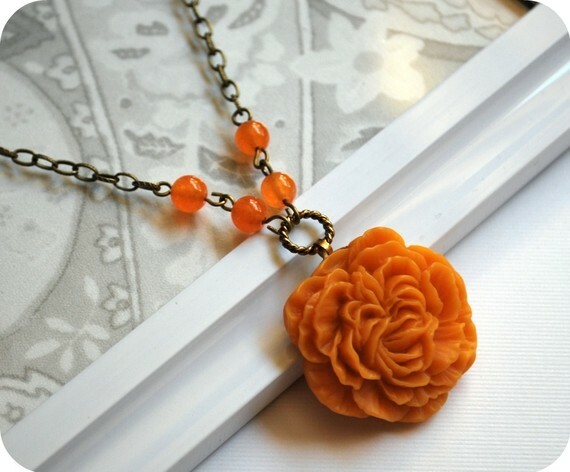 They're one of my new favorite etsy shops. 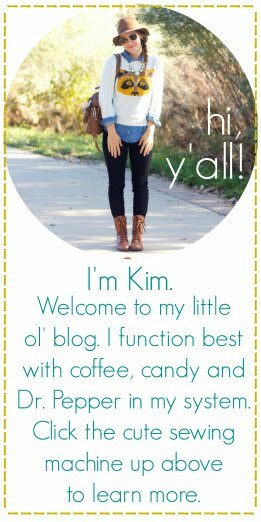 You'll hear more about them on Monday *WINK* ;) Anywho, you know how I feel about orange & aqua...and my love for mason jars is second to none. A perfect towel for me...I think I'd make it into a pillow. 4. Ruffled Peony Bloom Necklace from Polka Dot Moon. GORGEOUS! 5. F-U-N wreath made by one of my sponsors, Come & Knock. How pretty & unique is this thang? Yes, I said THANG. 6. 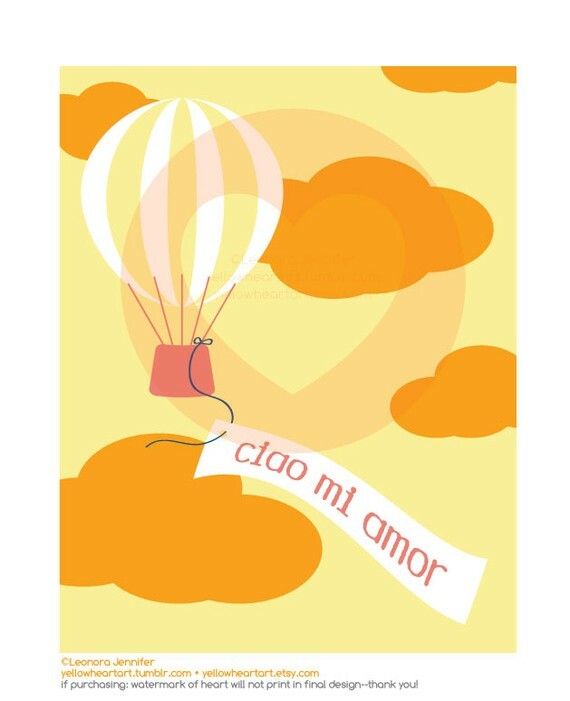 Yellow Heart Art's Ciao Mi Amor Print. Hot air balloons? I'm all in. 7. The NEW Clementine Coffee Cuff NOW available in the shop! While you're at it, click on over and check out all the new coffee cuff designs for April. I promise you'll love them! There are also lots of new rosette colors available. I LOVE that bike print and your super cute scarf!! And that mason jar tea towel is adorable!! You should totally get it and turn it into a pillow!! Have a wonderful day Kim!! Can't wait to meet you @Creative Estates! After I read this post I was browsing on Old Navy's website and saw this orange ruffled bathing suit. I thought you might like it! Love the scarf!!! Too bad I cant pull off orange as a redhead!! 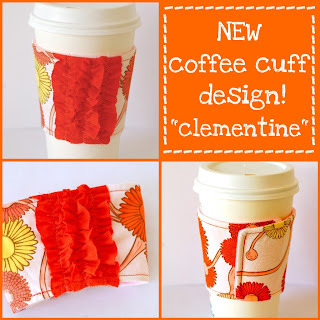 love the new coffee cuff---especially the umbrella one! oh man. if my bumblebees already increased my uptake in coffee, i can't imagine what the umbrellas would do! poor jon! i'd be WIRED! That mason jar tea towel is adorable, and I'm smitten with that print! You would be floored to see how much bike art a single cyclist can amass, so I should be careful not to show this to John! 1. I love that bike. I am seriously in love with. and I would be happy just staring at it all day! love love loving all of this! i heart orange too lately, except sometimes i have to be careful because my hair is red and certain shades completely clash. love your scarf, the necklace, the wreath...oh my goodness, all of it! 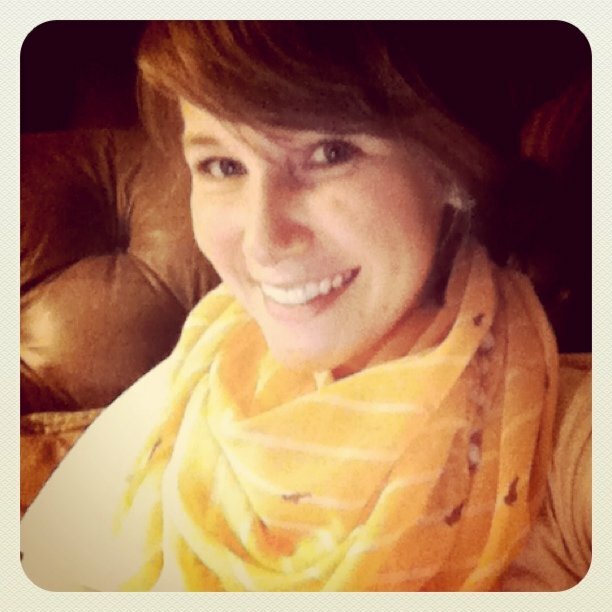 Oooh, the pom pom scarves I just saw some and wanted to make my own, with a little twist! I think they are so cute.